A colour photograph of the Guthrie house. The original porches were replaced with sun porches circa 1970 by William Guthrie and family. New porches were added circa 1990 by William Dwight Guthrie and family. 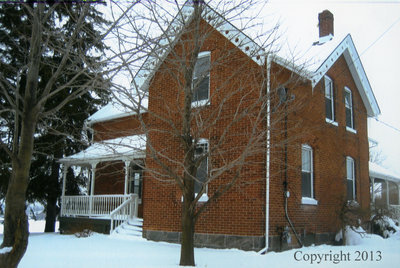 Mr. John Guthrie purchased Lot 35 on Concession 4 in Whitby Township circa 1840 and shortly after built a frame house. Circa 1890 a modern house was added onto the old frame house. The older house was used as a kitchen and later a garage. The buildings and land were sold in 2009 to make way for the 401 to 407 link. They were demolished in the summer of 2013. Guthrie Residence, 2013. Whitby Archives D2014_005_003.